lt;stronggt;AVE09901lt;/stronggt;lt;BR/gt;Avery Durable View Binder with Two Booster EZD Ringslt;BR/gt;Durable construction is ideal for frequent reference. EZD rings have a higher page capacity compared to the same size round rings. Ring resists gapping for smooth page turning. 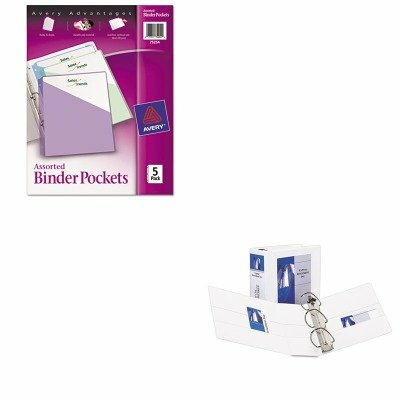 Organize and secure paper with four interior pockets. Wider panels cover standard dividers and sheet protectors. Pages lie flat with back mounted rings. Holds 8 1/2amp;quot; x 11amp;quot; documents. Locking ring mechanism holds sheets securely. Capacity Range Max: 5amp;quot; Sheet Capacity: 1,050 Colors: White Binder Sheet Size: 11 x 8 1/2.lt;BR/gt;lt;BR/gt;lt;stronggt;AVE75254lt;/stronggt;lt;BR/gt;Avery Durable View Binder with Two Booster EZD Ringslt;BR/gt;See-through pocket holds up to 20 sheets. Fits standard three-ring binders. Diagonal cut front flap for easy access to contents. Durable, nonstick polypropylene won't lift print. Colors: Assorted Height: 11amp;quot; Width: 8 1/2amp;quot; Quantity: 5 per pack.